delivers cost-effective, robust, high-quality solutions, help manufacturers in manufacturing leadership to have better Japanese technology share for more practical faster ways, thereby vendors achieve top position by deploying practical solutions that include a combination of information, business, manufacturing and supply chain technologies. Silicon is found near the earth's surface in an abundance supply next only to oxygen. Silicon (Si) an element among approximately 100 different elements exists as an oxide (silica stone). Converting silica stone into polycrystalline or metallic silicon is first made with a purity of 99% by reduction with carbon. Trichlorosilane is produced from metallic silicon, purified and refined by distillation. Reduction is performed with hydrogen at temperatures of about 1,000oC, depositing a 99.999…% (in eleven 9s, also called 11N), thereby pure polycrystalline silicon in rod or needle is formed. You can do things the long way or you can do things the efficient way by having Japanese market oriented locals involved in your operations. To work on other people’s timetable is a challenge itself. You will be introduced to people who can work as your own in Japan. At your home front you may be busy and may not have time to attend unforeseen bizarre business practices. Instead of exploiting the local people, it is more beneficial to educate and motivate them, to maximize their output. What maybe an offbeat culture for you maybe a success story from Japan. Polycrystalline (also called Multi) is changed into monocrystalline (also called Single) silicon and then into wafers, and further integrated into required applications. Polycrystalline silicon is an aggregation of small silicon crystals. As a result, silicon molecules are irregularly aligned within the crystals and don't allow a regular flow of current even if electricity is charged. Monocrystalline silicon features a uniform alignment of silicon molecules in three dimensions, resulting in a set level of resistance to electrical current in integrated circuits. Integrated circuits control electrical current, so it is desirable to have a constant electrical resistance. For this reason, polysilicon is melted once (melting point:1,414oC) and recrystallized to singlecrystalline silicon. When Polycrystalline silicon is turned into Monocrystalline silicon, impurities cause an un-uniform alignment of molecules in Monocrystalline silicon. 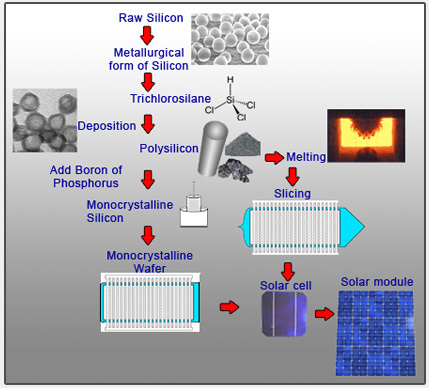 For this reason, a high level of purity is required for making Singlecrystalline silicon. Monocrystalline silicon itself does not allow passage of electric currents. Boron or phosphorus is added as additive in a trace of amount to provide the monocrystalline silicon with the property for transmission of electrons. However, if boron or phosphorus exists as impurities, in situ, even before addition of an additive, it is difficult to make integrated circuits of intended characteristics. For this reason, polycrystalline silicon also must be of a very high purity. Polycrystalline or Monocrystalline silicon are used as substrates in the production of solar cell. Excelling in power generation efficiency, demand for such solar cells is increasing mainly for housing use. Their widespread use is expected as a renewable energy source.